A couple weeks ago, when I was visiting my parents, my mom took me back into the woods behind their house and showed me this tree. It had been an old, massive White Pine, mature but still in good health. I love the pines on the property, the White Pines towering above the rest of the forest canopy, still catching the last rays of the setting sun even after it’s left the rest of the forest, the first to catch the early morning sun as it slides up over the horizon. They’re favourite perches for crows, who like to sit up in the highest tree and scan the landscape. They’re majestic in their strength, enduring, almost powerful. So to find one of these giants torn asunder, lying on the forest floor, is a bit of a shock. It takes a powerful force of nature to topple such a massive tree: this one was hit by lightning. We’re now experiencing an extended period of sunshine and nice weather, but for a while there we had thunderstorms virtually every afternoon. I remember talking to my dad on the phone one evening, and he’d commented that that afternoon they’d heard a crack of thunder so startlingly loud they knew it had to have hit nearby. It may have been this tree. They project so high over the canopy that they would be the forest’s inevitable lightning rods. Lightning with many step leaders and a single massive discharge strike. Borrowed from the Wikimedia Commons. I did a bit of research on how lightning works, though, and although lightning does generally target the tallest objects, they don’t necessarily always do so. Lightning works by the air particles beginning to ionize, or form directional charges, like the way a magnet has been ionized so that all of its molecules line up in the same direction creating a positive end and a negative end. The ionization spreads along the path of least resistance, but may spread out in multiple directions at once. These paths are called “step leaders” (note it’s leaders, not ladders, which is how I keep reading it). The direction is often, but not always, down towards the earth. 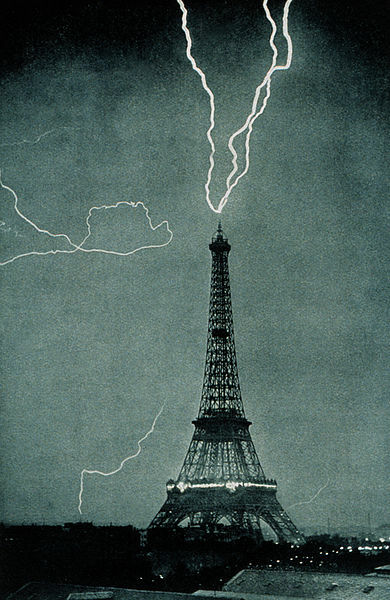 Lightning hitting the Eiffel Tower in 1902. Note the streamers coming up from the bottom. Borrowed from the Wikimedia Commons. As these step leaders start to get close to the ground, the air near the ground begins to form strong charges and the equivalent of reverse step leaders, called “streamers”, form from objects on the ground, reaching up into the sky. When one of the step leaders contacts one of the streamers it forms an unbroken path of ionization that the cloud’s electrical charge discharges through. The streamer to be contacted is often the one that reaches the highest, but it doesn’t have to be, depending on the path the step leaders take. All objects, including people, send out streamers, which is why you can still be hit even if you’re near taller objects. Both streamers and step leaders glow, but are not as blindingly bright as the discharge. The whole process, from the start of ionization to the connection of the step leaders and streamers, to the discharge of electricity, takes a fraction of a second. Prolonged lightning is actually multiple pulses of discharge flowing along the ionized path, but so quickly that it just looks like a long strike to our eye. The length of a roll of thunder represents the relative number of pulses (or “re-strikes”). The discharge is incredibly hot – hotter even than the surface of the sun. Anything it touches will be immediately burned, or, if liquid, vapourized, and if the medium doesn’t conduct electricity well, the excess heat created by the electrical resistance will cause the effect to be pronounced. This is what happens when lightning hits a tree. The sap within a tree is not very conductive, so rather than funneling the electricity through the roots into the ground, the sap vapourizes. Gas takes up more space than liquid, and so the result of this instantaneous vaporization is an explosion – tearing the tree to splinters. 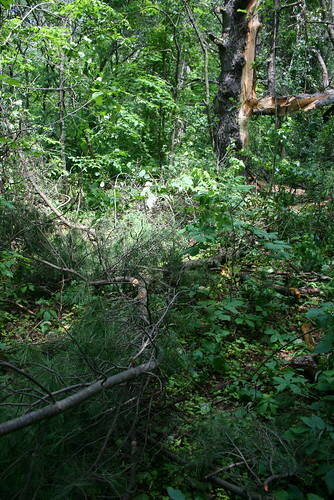 They’re a bit hidden in the ground vegetation in this photo, but there were splinters and chunks of wood everywhere. Oak and elm are the most commonly hit types of trees, but pine ranks third. They have deep tap roots that reach the water table, and typically stand higher than other trees in a forest. 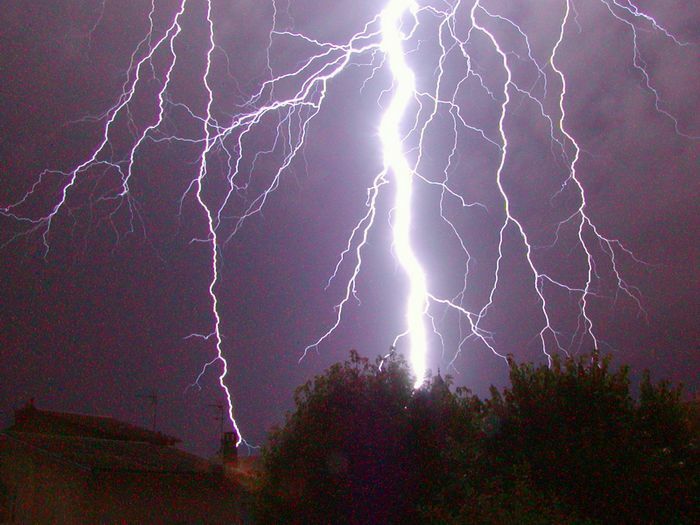 The high resin content and needles also contribute to higher electrical discharge, though Wikipedia fails to elaborate on why. Trees are actually a good way of protecting a building from lightning strikes. 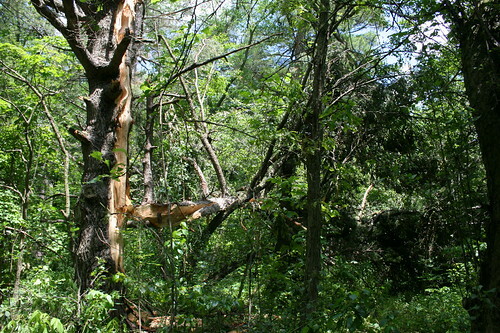 Some species are more capable of dealing with strikes – trees that have massive root systems, which spread out in the soil and have a higher biomass than the above-ground portion of the tree, have the ability to dissipate lightning very efficiently. 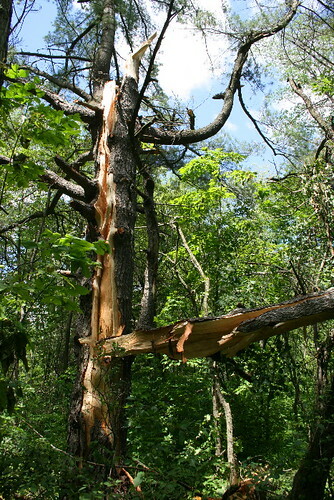 In most trees the lightning takes the path of least resistance, which is generally the wettest part of the tree, often outer layers where the sapwood is. This results in a burning of the bark, and possibly the stripping off of a small section of the trunk, but is generally easy for the tree to heal over from. Deeper wounds are more difficult to heal and usually result in the decay and death of the tree. In the case of my parent’s pine, the strike went right down through the heartwood and tore the tree in two. One side has a trunk and crown that is still standing and intact, but it’s hard to say whether the damage to the lower part of the trunk will be enough to kill the remaining part of the tree. If it does die, it won’t be a terrible thing – the Pileated Woodpeckers will love it. Great post! We’re heading out to Bon Echo tomorrow morning for five days; I’ll keep my eyes peeled for blasted trees. That information about the upwards streamers is interesting, too; this must be the reason people feel their hair stand on end before they’re struck, mustn’t it? That’s a wonderful explanation for how lightning works — thanks for putting it together with the great photos. I’m a bit boggled, thinking how people can send out streamers… I know it’s logical that people wouldn’t react differently than plant life, but it still sounds like a bit of the paranormal to me. And I wonder: if lightning tends to follow the wettest part of the tree, and it’s been raining (as is often the case during a thunderstorm), wouldn’t the lightning travel down the outside, and follow the wet trunk to the ground? G’day – I enjoyed looking through your blog. Excellent photos! I particularly enjoyed your moths. That’s almost certainly the reason people feel their hair stand on end, LavenderBay. I did actually come across a site that mentioned if you were feeling that, get indoors or drop to the ground pronto! Eyegillian, I do rather suspect that that’s often the case and the reason so many trees do survive lightning strikes – the electricity travels along the wet outer surface. 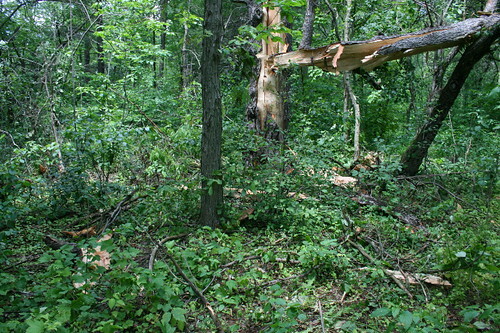 However, for trees with broad, spreading branches that protect the trunk from getting very wet, or in dense forests where the canopy shelters the ground, it would probably be more likely to run down through the sapwood. I’ve heard, and I don’t know if it’s true because I haven’t bothered to look it up yet (though I should), that animals will not eat other animals that have been struck by lightning, even if they’re usually not picky scavengers. I’m not sure whether it’s because then the meat is cooked, or whether the lightning changes the flesh somehow. Do you know anything about that? Can I use one of your images for a vidieo I have to make for a school project? Next Next post: Why am I (still) (bird) blogging?